Do you have a big conference, a user group, or product release coming up? Use your AdvocateHub to create an engaging and targeted experience featuring activities specific to that marketing initiative. By clicking on the new Experience card, the advocate enters the AdvocateHub Experience where Experience-specific challenges are available. How does an advocate know they are in an AdvocateHub Experience? How does an advocate return to the main hub? Advocates just need to click on < Back to HubName at the top of the page, above the event image but below the tool bar to return to the main hub. How do AdvocateHub Experiences Leaderboards work? AdvocateHub Experiences have their own leaderboards. Advocates will only appear on this leaderboard for points earned within the Experience. 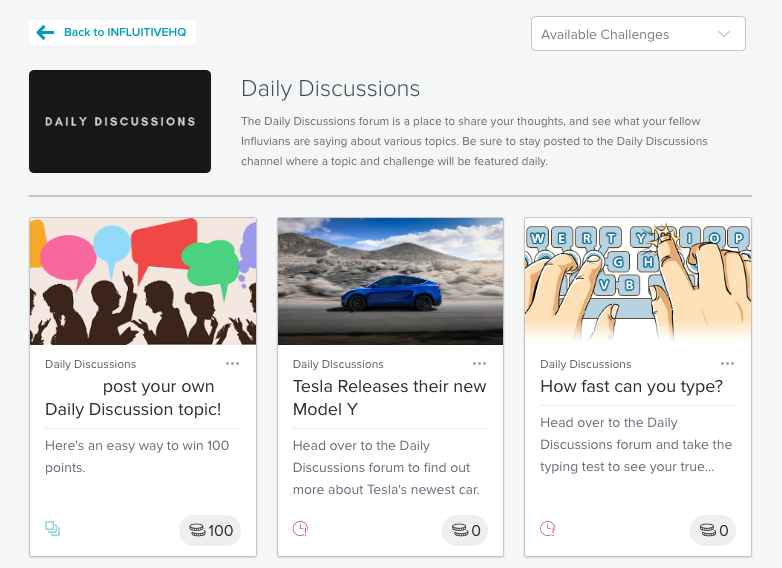 This great feature allows you to track, incentivize and award advocates for their participation. Points earned while in the Experience are added to an advocate's lifetime and current points, as well as their position on both the regular leaderboard and the Experience board. Experiences also have a public leaderboard viewing option, perfect for displaying on large screens during events. How do I set up my own AdvocateHub Experience? Take a look at the following article Creating a New AdvocateHub Experience for instructions on how to create your own Experience. 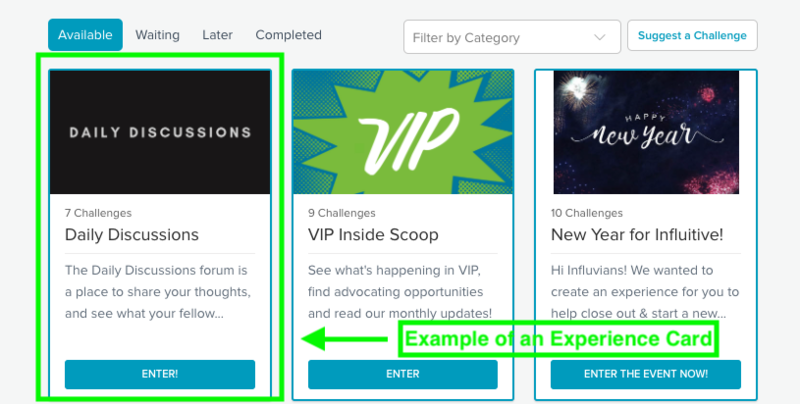 How does targeting of challenges work with AdvocateHub Experiences? A challenge can only reside within one Experience at a time. When editing a challenge's targeting options, you will be able to select an Experience to put the challenge in. If you do not choose an Experience, the challenge will be available in your AdvocateHub. For more information, check out this article. Looking for inspiration and ideas for using AdvocateHub Experiences for events? Check out this AdvocateHub class featuring star customers Chris Peltz from HP and Deena Zenyk from SMART to learn some real-life examples of successfully organized event advocacy campaigns.